I was fortunate to grow up with Ghanaian immigrant parents who are now citizens of the United States. As a child, they taught me the strict values of what it takes to be a good man. Growing up in the Bronx in the late '90s and early 2000s was not an easy place to live; however, my parents did what they could to give me the tools to survive in that urban jungle. I was not always able to look to them as a resource when it came to my studies and how to navigate the streets as an American, but their values stuck with me and made me think about decisions I was making, not only for myself but as a reflection of them as well. It was as if I had “fairy parents” following me around everywhere. I was always conscious of making the right choice. My father was there for me every step of the way — leading the family, supporting those in need and giving to his community. My mother was always “doing too much,” in my opinion as a kid, in terms of always wanting to help. I couldn’t understand when she made her way to help someone even if it required her to sacrifice something of her own. After joining Alpha Phi Alpha Fraternity, Inc., everything became much clearer. It was a spiritual awakening, I would like to call it. It has been a privilege to be around a bevy of genuine men that share the same core values and have gone through a maturation process similar to mine. I have learned some of the most important life lessons as a result of my membership — the greatest "test of man" is what the Alphas like to call it, and it prepared me for life. 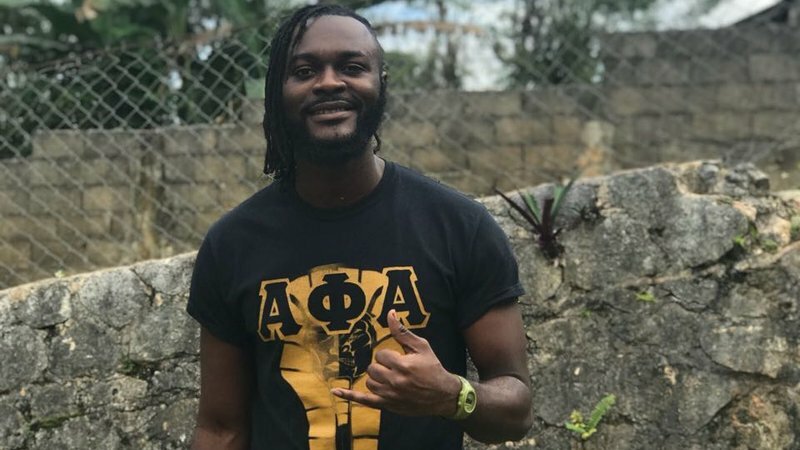 Processing life on a daily basis became easier as a member of Alpha Phi Alpha Fraternity, Inc. Navigating through life struggles was easier; I was able to manage my time better and never panic. I often think critically of the various directions one route could take me when faced with a challenging decision and I feel like I have reached the light at the end of the tunnel with an endless amount of opportunities, a wealth of access and ideas, brotherhood, genuine friendship and camaraderie that we share all across the United States and internationally with my membership into Alpha Phi Alpha Fraternity, Inc.
During my time in college, I was interested in the Peace Corps and saw it as an opportunity to give back internationally. Alpha has shown me that community service is something to take pride in, as a participant in a various relief initiatives. The confidence to achieve is what pushed me to serve with the Peace Corps and continues to mold me throughout my never-ending journey of capturing Alpha. I am thankful that the Brothers of the Pi Beta Chapter of Alpha Phi Alpha Fraternity, Inc. saw someone who just needed to be guided and supported and, with that, he will take off. The Peace Corps led me to Jamaica, to the hills of St. Ann, giving back to an underserved but proud and jovial community. More goals have been added to my life’s process through this journey and, without my parents and Alpha, I would not have wanted to challenge myself. I refuse to make any excuses because I am blessed with all the tools for success. Alpha’s seven founders did not complain when they were facing racial injustices in Cornell in the early 1900s. Many of our famous alumni strengthen us younger brothers to go out and achieve as much as possible and to help out as many as possible along the way. The Peace Corps was a no-brainer for me. It is where I fit and where my skills are being maximized in a large capacity. I want to touch the masses in a real way. This has been an overwhelming experience and we are transforming lives and making better leaders every day. The spirit of giving and humbling oneself is what Alpha Phi Alpha and the Peace Corps share. 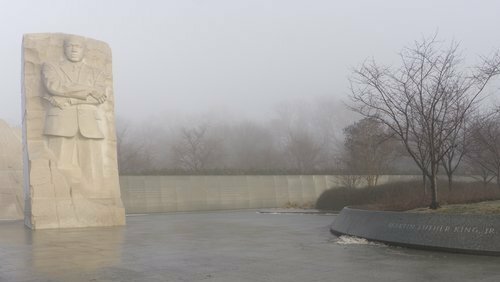 The Martin Luther King Jr. Memorial in Washington, D.C.
Brothers of Alpha Phi Alpha excel in the Peace Corps because we genuinely want to lend a helping hand and learn about other cultures. I can say most of my brothers love to travel and we can thank the fraternity for giving us our first tastes at road trips and discovering the unknown. To acquire more knowledge, you have to learn from various angles, speak to different minds and go places others haven’t. Our fraternity brother, Dr. Martin Luther King Jr., smiles down at his fellow brothers today because he knows we are strengthening our fellow man and woman and trying to make a difference in all walks of life. No feat is too mighty. We must have faith and continue to push through. Ampofo Mensah is a Primary Literacy Adviser in Jamaica.